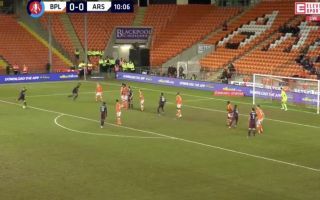 Joe Willock proved his goal scoring instincts this evening, as the midfielder was on hand to give Arsenal the lead against Blackpool in their FA Cup Third Round at Bloomfield Road. 19-year-old Willock opened the scoring for the Gunners in the 11th minute, after a free-kick from Aaron Ramsey ended up falling to the youngster, who headed into an empty net to give Unai Emery’s side the lead. You can catch Willock’s goal below. Great reactions from the youngster to finish that one off!